Hello everybody. Since I have another procedure later today, I decided to use my energy for the day that I usually reserve for a couple of household chores to do a post and try to get ready mentally for the lumbar puncture at the same time. It’ll also get my mind off the possible complications that come after every new procedure. After this one, barring unexpected complications like the one that sent me to the hospital the last week of March, I should be free to be “normal” until the next infusion around April 22. When you first hear those dreaded words “you have cancer” for the first time, and the doctor explains some of the changes about to take place–things like foods to avoid (some really surprising like raw veggies and fruits) and the care you’ll have to take to avoid anyone with any illness, even a common cold, you begin to worry whether the grandchildren in your life will be able to comprehend what’s happening in such a way that you’re still a real person in their lives and not just a shadow of someone they once knew. So my daughter (Moe) explained to Thomas and Vimmy that Grandma’s cancer would need to be treated with strong medicines, that they wouldn’t be able to visit her if they had colds or sore throats, that they would have to be especially careful to keep their hands washed or sanitized everytime they were visiting, and that Grandma’s appearance would change drastically in a short time. The medicines would cause her hair to fall out after a few weeks. Thomas (7) had heard the word cancer before as I believe his neighborhood friend’s grandmother had died a year or two back with it. Even though he must have wondered, he didn’t ask about death. Vimmy (4), on the other hand, came right out and asked what seemed most pertinent to her. “Is Grandma going to die, Mommy?” They were both reassured that Grandma’s cancer was caught early enough that it was almost certain she would not die from it. 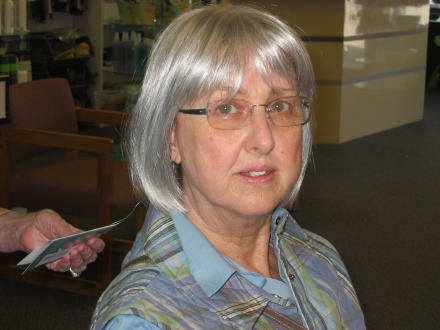 My oncologist recommended that, if I were considering a prosthesis (wig), it would be best to shop for it sooner than later. Most people are completely bald by day 14 after the first chemo therapy. 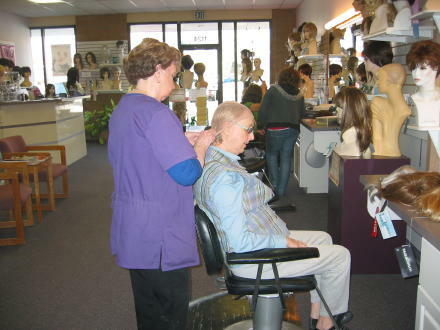 So I made a date with my daughter and granddaughter to go shopping for a wig while I was still feeling pretty good, on the Tuesday following Friday’s infusion. The ladies weren’t very happy as my daughter was unable to leave work until 3 and we got there at 4:30 and they close at 5. They tried to talk us into another day saying we needed at least an hour, but I needed to get it done that day. Finally they relented, and we worked very quickly to make a choice and get out as closely as possible to 5. They weren’t very happy that I had asked Moe to do a photo session because I wanted this to be a happy memory for my granddaughter to remember. I certainly understand their position, I’m just not sure how well they understood mine. Hopefully, they’ll never have to go through such an experience to learn this lesson. I would not wish it on anybody, but life or the universe of however you prefer to think of does have a way of teaching us all lessons we need to know of life sooner or later. I instinctively chose this red one because I knew that one–it seemed like a fun way to spook my friends–and two, it would be a color I’d never choose for my real hair and a style I’d never be able to carry with my baby fine hair. 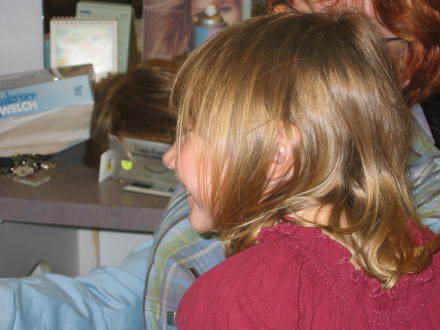 After I’d chosen it, my daughter wanted to gift me the dark blonde in the center because it was the color I’d always wanted (like Vimmy’s) and never had been able to successfully duplicate, and also incorporated all the natural colors I’d had over my lifetime–from tow-headed blonde to a darkish brown/brunette in the back. Now I’d be able to have real fun trying new hair and clothes combinations. That’s was completely understandable in Vimmy’s eyes. 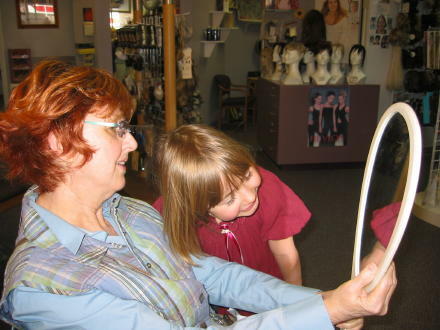 Nothing at all would do until Grandma tried on the one wig in the shop that look best on Grandma according to her! This black one made me look younger she thought. Unfortunately, Grandma thought it made her look a little witchy as well so she begged off complaining that it made her feel much too hot on the neck, and summer would soon be here after all. That seemed to serve as a “good enuf” explanation, especially when we took a picture of her in it for posterity. Vimmy does have expensive taste. The one she wanted Mommy so desperately to buy her was a whopping $300. We convinced her it was much too large for her, and Mommy would find a shop for kids and buy her one that cost much less! A week later, after living a week of “pleasure deferred being pleasure doubled,” a valuable lesson according to Grandma, Mommy found her a near-duplicate for about $7 which has given her a lot of pleasure dressing up like a Hawaiian girl. The girl does have a flare for drama! Well that’s about all for today. I’ve spent a lot more time and energy than I expected, but I hope you enjoy our wig shopping adventure as much as we did. Hope you all did get used to Hubby’s writing and expect him to keep at it, and I think he should because his updates were really good (with a touch of humor). He is threatening to quit though. I will have to beg and plead him to do the future posts updating my situation for all of you when I do not feel like it. I have to tell you Alice, you look tres chic in the silver wig. Of course, I am partial to that color. Ha! I’m so glad to see a post from you!!!!! I miss you!!!! And I like the silver and the red best — although the blonde has a certain charm!!! I appreciate your sharing this adventure with us!!!! Yes!!!! Hubby simply must keep us in the loop! He’s doing such a great job and we appreciate it immensely!!!!! Hugssssssssssss to both of you!!!!!! Here are my opinions. I’m delighted you did not select the silver one. The blonde and the red are your colors. The styles are flattering, too. 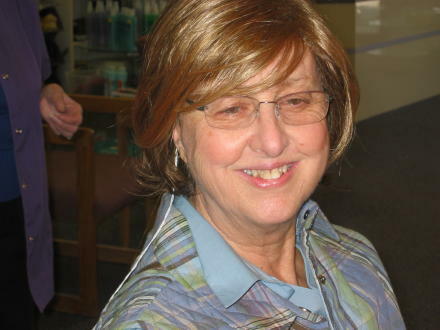 I’ve heard stories that hair grows back differently after chemo. My friend Diane, who had frizzy hair, ended up with a head of wavy hair. Perhaps you will get that head of thick, luxurient hair you’ve always wished for. That black one is great! I like the red and the dark blonde ones on you a lot, actually. 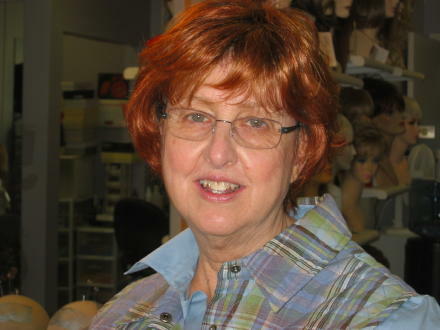 I think you chose the very best wigs in color and style! It looks like it was a fun little outing for you, daughter, and grand daughter … and I’m glad you thought “oh phooey” to the clerks who were just worried about getting off on time! Hubby does need to keep writing when you can’t! He has a fun style and we need to know how you are and what is going on! I think you just look cute as the dickens in all of them – well, maybe not the black, long hair. Yay for you inviting your grandaughter to be part of the experience! I think it will make her a stronger woman when she is older. Heck, I think it will make her a stronger teenager – and teenagers need all the strength they can find. Hugs and prayers – I love that you’re getting prayers from everywhere. That’s cool. Glad to hear from you and love the pics. The silver wig is very chic, but you know where I’m coming from. I’m happy to know there is a fun aspect to this. Bringing Vimmy along was a great thing. I remember too many times when cancer was an unmentionable specter in my family. I love you in the red one. Yes! What fun. 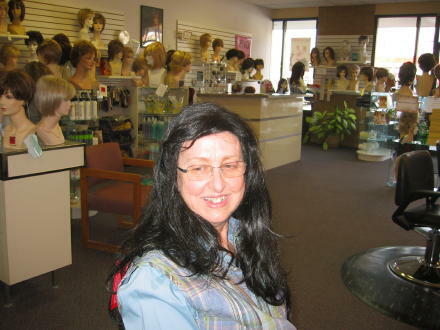 Do stop by a cancer society Discovery Shop when you have time and energy, they will give you a wig for free. Convention….it was 3000 alcoholics with their wives and some kids. Sober families can have an awful lot of fun together. 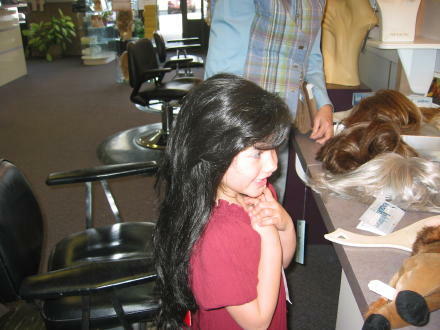 I am so glad to hear about the girlie adventure to purchase new wigs. Hubby did really well and I for one look forward to more of his posting!